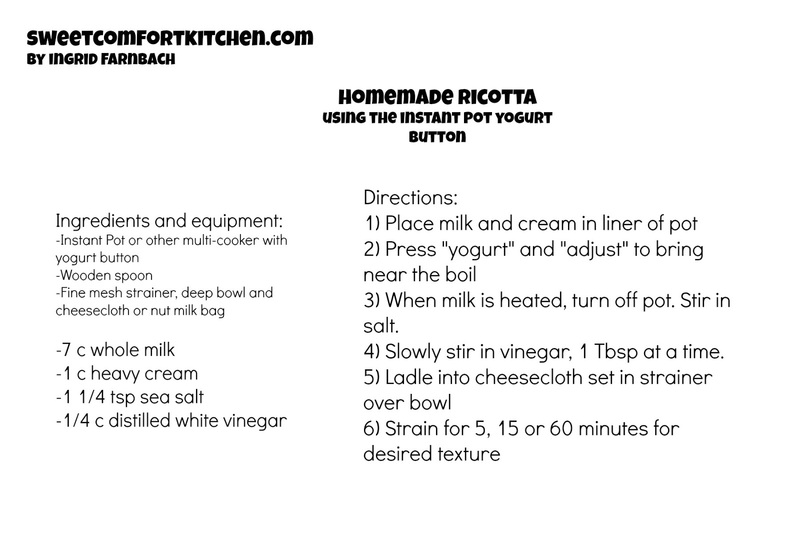 ...an Electric Pressure Cooker recipe made with my Instant Pot Duo's yogurt button, yields about 2.5 cups ricotta, takes 30 minutes to an hour depending on how long warming function takes, but no babysitting it. I was a little confused when I first found out that you can make ricotta in a pressure cooker, until I figured out that you don't put it under pressure, you just use the yogurt setting to bring the milk gently up to a safe temperature to make the cheese. This is technically not a true ricotta, the name of which means re-cooked because it's made from the whey left over from making mozzarella, but it's delicious and it fits wherever a true ricotta would. This is one of my current favorite things to eat, although I think I like it better with a pear instead of an apple. 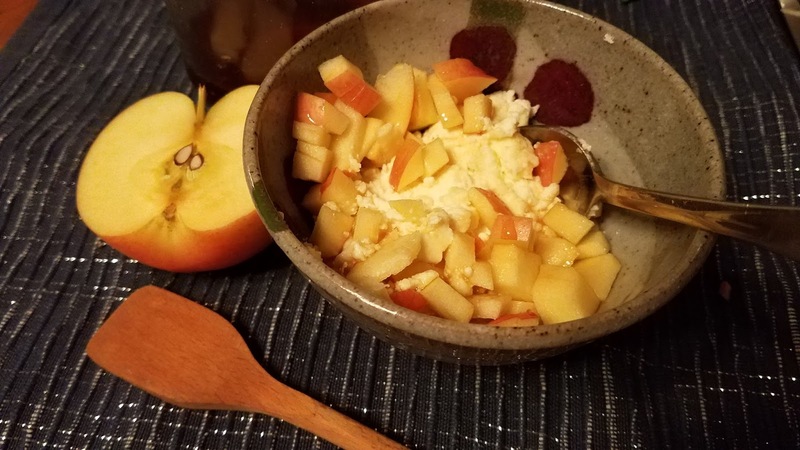 Diced fruit, a teaspoon of honey and a sprinkle of cinnamon or nutmeg...perfect as a snack or dessert, or add toasted nuts for a fall version of Ina Garten's breakfast ricotta. Use it in lasagna or cannoli--anywhere you'd use ricotta from the store. 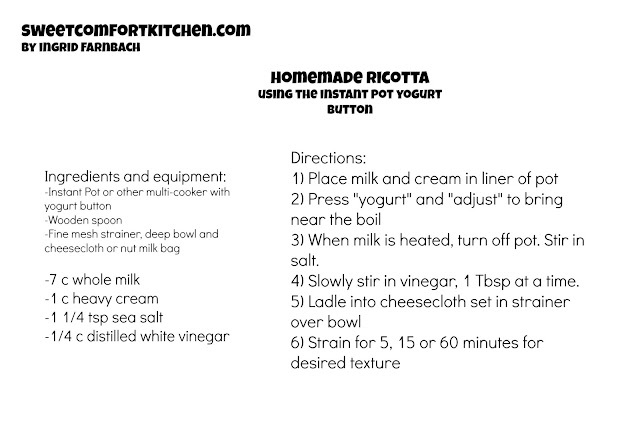 You can, of course, make ricotta using a pot on the stove or even a microwave. I like this option because I don't have to worry about scalding the milk with one of the other techniques. 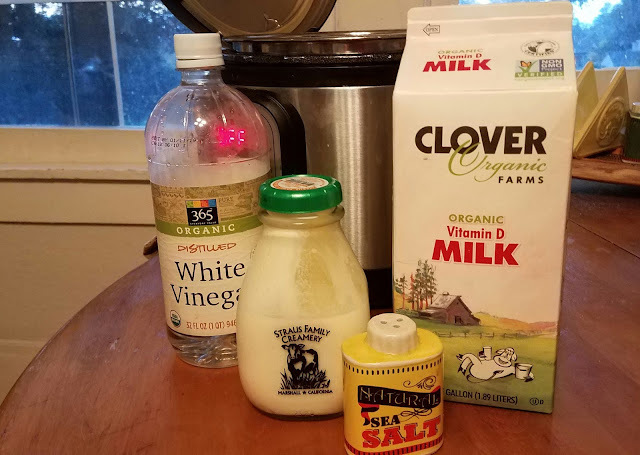 All you need are these few ingredients...instead of white vinegar I've tried using lemon juice, but kept having to squeeze more lemons because the ones I had weren't very acidic. I've tried using white wine vinegar, but the kind I can afford left a funny taste in the cheese. You can also use just whole milk, but the texture is better with a little cream. 7 cups whole milk and 1 cup heavy cream (or 6 c milk and 2 c cream, or 1/2 gallon whole milk). Lock on the lid and press the "Yogurt" button. 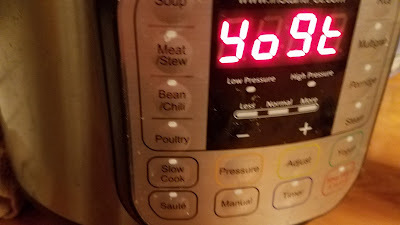 The display should say 8:00, and then you press "Adjust" once so it says "BOIL". Once it comes up to 180 degrees, it will beep and the display will say "YOGT". 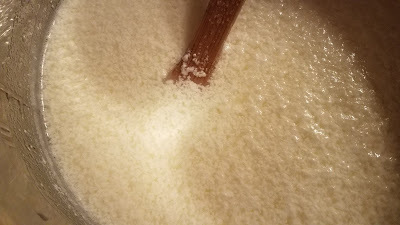 As the vinegar starts to transform the milk into curds and whey (yup, just like Little Miss Muffet), you won't see the curds but they'll start forming. As you stir in the last of the acid, the curdling will become more visible. Let sit for a couple of minutes while you set up the strainer. To strain, you can use two layers of cheesecloth or a nut milk bag, both available online or at Whole Foods (other markets should at least have some cheesecloth). 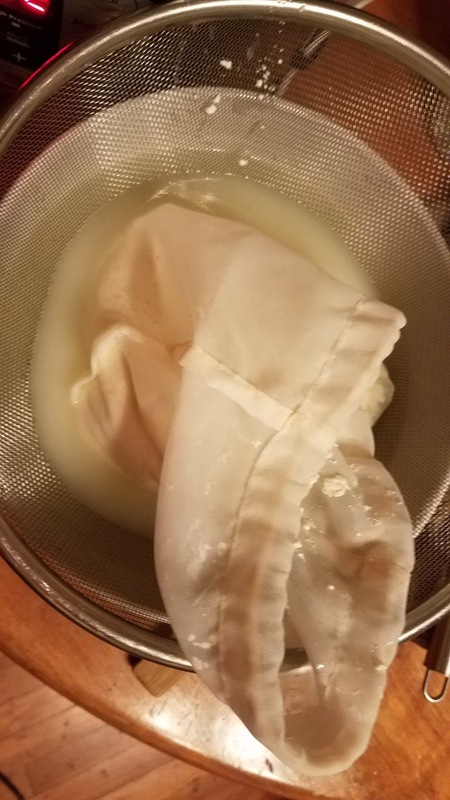 Set the cheesecloth or bag in a fine mesh strainer set over a deep bowl. This bowl wasn't deep enough, so I had to dump some of the whey into another bowl. Oops! 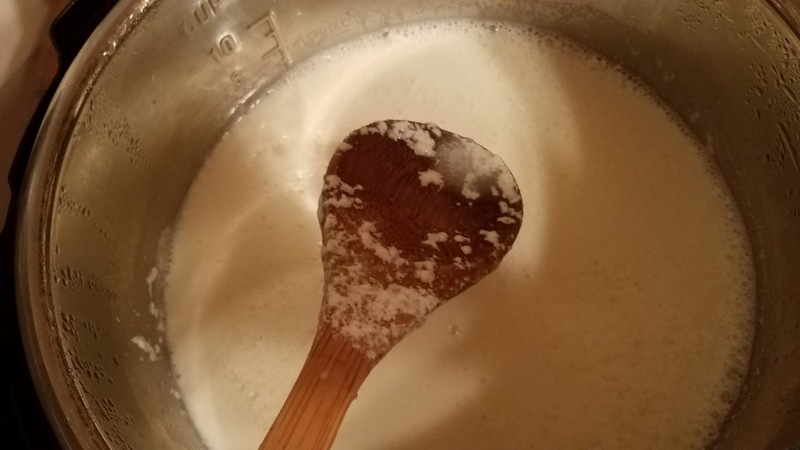 Let the curds strain for 5 minutes for softer ricotta, 15 minutes for drier ricotta for making lasagna or gnocchi, or up to an hour for something harder and more paneer-like. 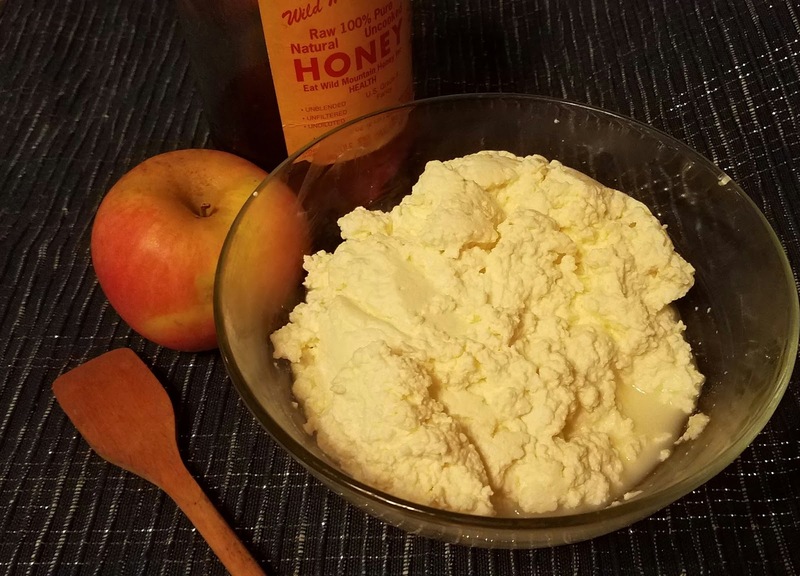 Enjoy as you would store-bought ricotta, although you might not enjoy that anymore! Every time I do it I feel sad that so much whey comes off, but the good news is that you can use that whey in place of water in baked goods and smoothies. It's much more palatable and less acidic than the whey that comes from making Greek yogurt, so you can actually sip some of it if you like. Kinda tasty!